The Detroit Muscle Crew II project was finished — all 18 glass block windows and two side doors at the Cathedral of St. Anthony had been replaced — thanks to a $5,000 donation from A Hole in the Roof Foundation. But in the eyes of Mike Stephanoff, finished didn’t necessarily mean completed. 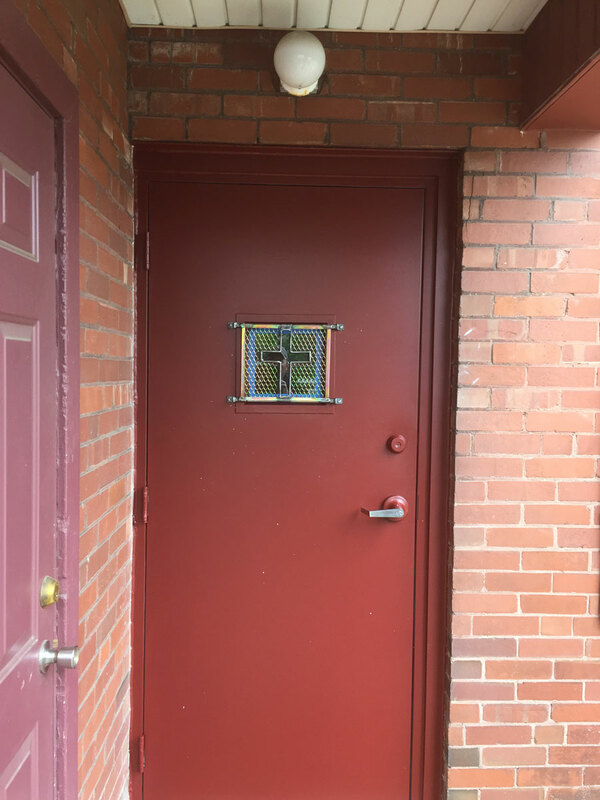 The DMCII volunteer and owner of One-Step Home Solutions, learned after the project that the front doors to the church desperately needed to be replaced. They were rotting, unsightly — and 115 years old. Foundation funds depleted, Stephanoff developed his own fundraising plan and began spreading the story about a small church on Sheridan Street in Detroit that does big work, assisting thousands of residents each year. In just under two months, Stephanoff had raised a total $9,609 in donations. And on Sept. 29 the possible happened: four new front doors to the church were installed. Thanks to Stephanoff’s generous heart, he and his crew once again donated their time and services to St. Anthony for free. Stephanoff isn’t new to volunteering. As a younger man, he frequently donated his time to others in need when he served in the Navy. “When I answered the call to Mitch Albom’s article (last spring) to join the Muscle Crew, well, it just feels good,” he said. There’s above and beyond, and then there’s WAY above and beyond. That sums up the dedication and commitment of Detroit Muscle Crew II members Mike Stephanoff and Ron LaBarge of One-Step Home Solutions. We are happy to report that our first major project of the DMCII is completed at the Cathedral of St. Anthony (5247 Sheridan Street, Detroit) largely because Mike and Ron continued to step up to the plate and make sure that the food and clothing pantry, and the entrances to the 100-plus year-old church, received the necessary improvements they sorely needed. The final phase of the project consisted of installing two new steel entry doors; the first phase (completed a few weeks ago) included the installation of 18 new glass block windows. You can read our previous posts to learn more about the contributions of Mike, Ron and other DMCII team members on that part of the project. Mike, who served as the manager of the St. Anthony improvements from beginning to end, logged a total of 60 volunteer hours on the projects over the course of the past few months; Ron totaled 54. Materials were purchased via funds that Bishop Karl Rodig’s church received from the Hole in the Roof Foundation via Mitch Albom’s S.A.Y. Detroit 2016 Radiothon. The church’s food and clothing pantry assists thousands of residents each year. DETROIT — It has been a few weeks since your last Detroit Muscle Crew II update about the work being done at the Cathedral of St. Anthony in Detroit, and it’s time to get you up to speed. And give you major plaudits. And ask for more help. As you’ve been reading since mid-spring, the Cathedral of St. Anthony was the recipient of a $5,000 donation from S.A.Y. Detroit’s Hole in the Roof Foundation for window replacement as well as other repairs at its food and clothing pantry which serves thousands of homeless and impoverished residents each year. 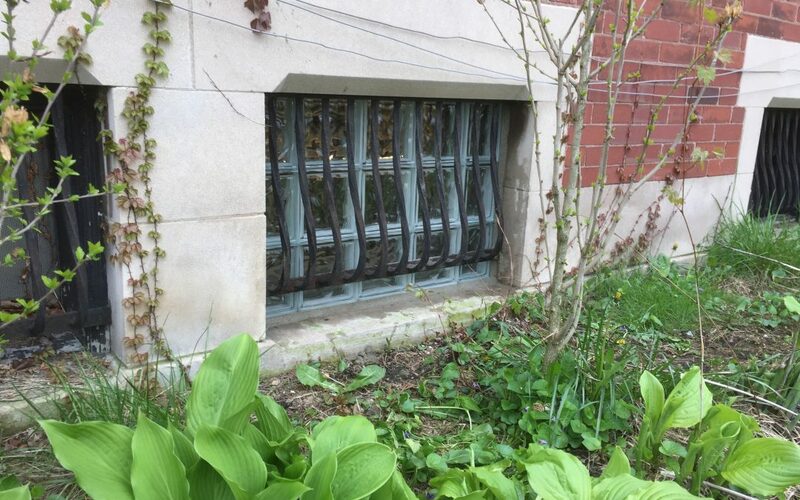 Thanks to members of our volunteer Detroit Muscle Crew II, 18 new glass block window units were installed, along with a new door, while four others were adjusted throughout the rectory. So many wonderful people stepped up to make this project a success thus far. In fact, they’re so good that St. Anthony reports that it has approximately $3,500 left from its donation, and would like your help to replace some of its 100-year-old doors on the other side of the building that might need to be custom-built (more on that in a bit). But back to the first phase of the project. 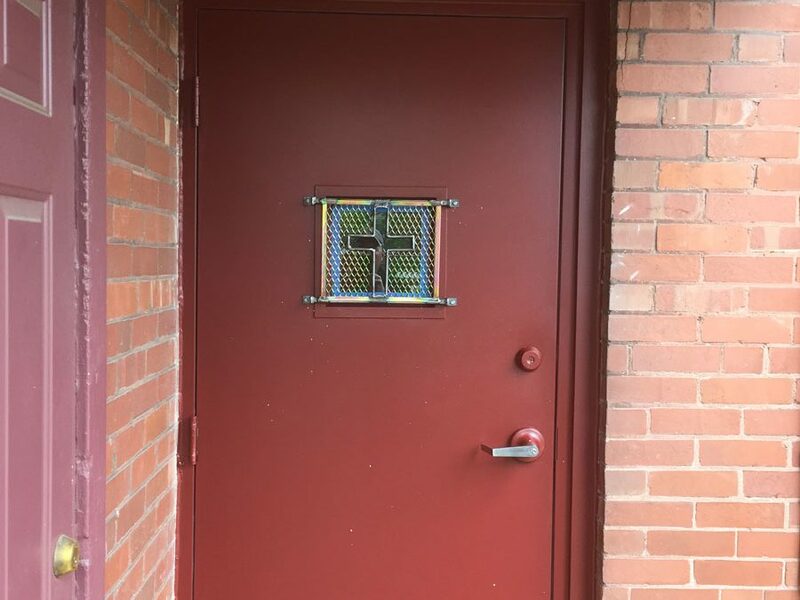 Thanks to the leadership of Mike Stephanoff, who logged more than 40 volunteer hours on the project — from getting the best deal on 18 glass block units and organizing the crew, to fabricating and welding a steel grate himself for the pantry door — St. Anthony is now able to carry out its work in a much-improved setting. The topper? The door that you see in the photo was donated to Mike for the project by Jon Krebs of the Madison Heights Glass Company in Ferndale. The value of the door was $1,000. Thank you Jon! In addition, John’s Lumber donated the plywood, rigid foam, caulk and shims purchased for the project (value: $208.23). Thank you Bill Brys and Chuck Diel! Of course, the project couldn’t have come together without Scott Albaugh, owner of Albaugh Masonry. Scott sent over his team of masonry professionals to tackle the window mortar work on installation day. Their total number of hours logged was 34. The other members of Mike Stephanoff’s crew: Ron LaBarge (33.5 hours), Al Colcernian (17.5), Joe Ferrara (15.5), Roy Seton (8.5) and Tom Stephanoff (4). Muscle Crew member Jim Primeau also came out a twice during the project to lend a hand. We’re looking for a few carpenters and painters to finish the project. The job would entail replacing rotted side doors at the church and painting or staining them. St. Anthony will pay you for the materials with the funding that remains from the donation. But they need help from the Muscle Crew with the physical part of the project. Since we want to get this done quickly, please contact Jim Penrod directly at the church. He’s the clothing and food pantry coordinator at St. Anthony; his cell phone number is 586-206-3827. Just so you know, he will check with us first to make sure the volunteers are registered Muscle Crew II members before proceeding. If you haven’t yet signed up to volunteer, you can do so here. Once again, thank you for your generosity! And don’t forget to visit your Detroit Muscle Crew II page at saydetroit.org/muscle-crew. 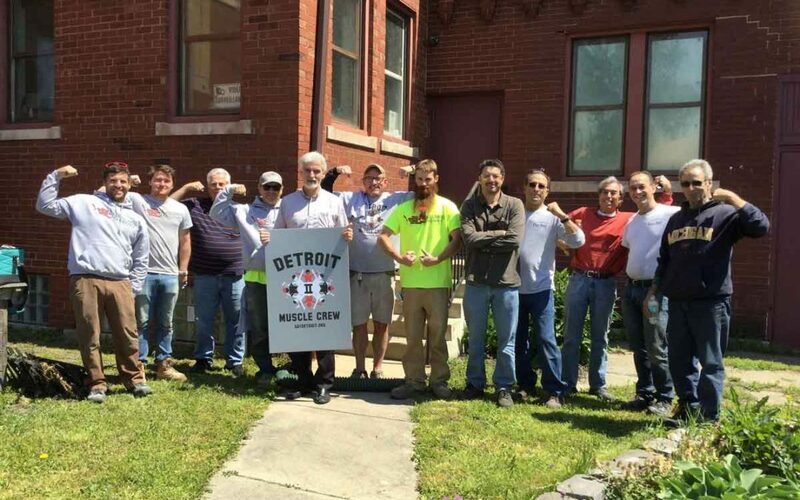 DETROIT/MAY 12 – Only when the church bells rang out at noon did the Detroit Muscle Crew II team of volunteers take a break. The crew spent the day on Friday volunteering their labor at the Cathedral of St. Anthony on Detroit’s east side replacing and installing more than a dozen glass block windows around the church’s food and clothing pantry. The window installation was the first phase of the work that’s being done at the church that feeds and clothes hundreds of poor and homeless people each year. St. Anthony received a $5,000 donation from A Hole in the Roof Foundation from funds raised at the 2016 Mitch Albom S.A.Y. Detroit Radiothon. Those funds are being used for materials; the Muscle Crew is supplying the labor. The St. Anthony project is being led by Mike Stephanoff, president of One Step Home Solutions, who on Friday brought four colleagues: Allan Colcernian, Roy Seaton, Ron LaBarge and Tom Stephanoff. His team will return Saturday to install a new door and repair several others with the help of fellow volunteer Joe Ferrara. Supplying a major assist replacing and installing the windows Friday was Albaugh Masonry. The company graciously donated the services of four of its employees: Ray Beebe, Simon Albaugh, Eric Sanderson and John Beebe. Also lending a hand — err, make that some muscle — was Muscle Crew II volunteer Jim Primeau of Oxford. The spirit of cooperation between the skilled trades professionals was evident throughout the day. Bishop Karl Rodig of St. Anthony, said he has been overwhelmed by the generosity and kindness of the group. Because not all of the funds will be exhausted after the two-day first phase of the project, the Muscle Crew will return in the coming weeks with (he hopes) a painter and a roofer for a few more repairs. Two windows down, 16 to go! That’s the report from Mike Stephanoff, who’s leading our Muscle Crew II’s first project at the Cathedral of St. Anthony, 5247 Sheridan St., Detroit. 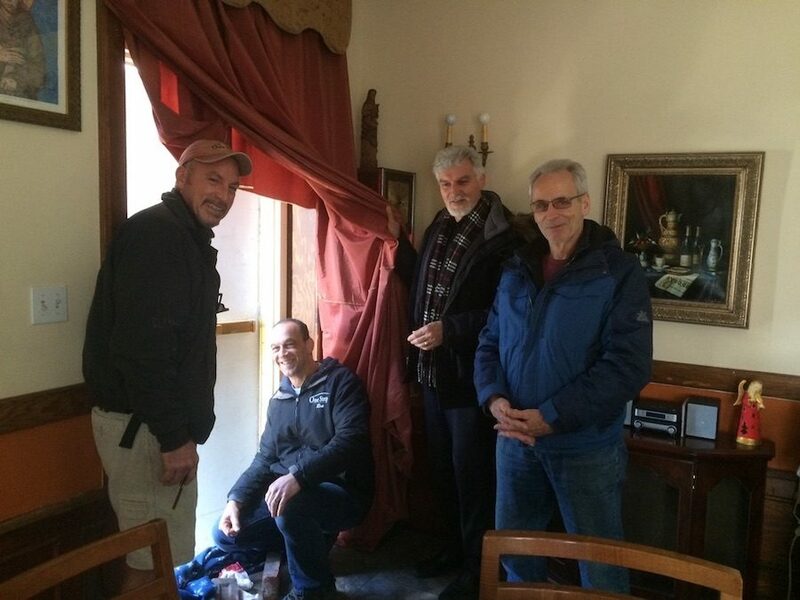 On Saturday, April 29, Mike and two colleagues — Ron LaBarge and Joe Ferrara — were successful in their test run: They replaced two basement windows with prefabricated glass block units at the church’s clothing and feeding shelter. As you can tell by the photo, the window unit looks great. Now this is where you come in: We’d like to complete this portion of the volunteer project onMay 12-13. The starting time on both days will be 8 a.m. Mike has already lined up three volunteers and he’d like to recruit a few more — specifically, two masonry professionals and two or three general laborers on Friday and Saturday, with an additional request for two carpenters on Saturday. The carpentry job will entail replacing a steel door unit, and repairing several other doors. All materials will be provided; just bring your muscle. If you’re interested in volunteering all or part of your day, on both or either day, please contact DMC II at musclecrew@mitchalbom.com. This is a registered event; we will be in contact via email if you’re selected. Please realize that it will be difficult for us to accommodate everyone who’d like to help on this project. If you miss out on this one, don’t worry — there are many more projects on the horizon! And remember: Don’t forget to visit your Muscle Crew II web page at saydetroit.org/muscle-crew to stay on top of the latest developments. DMC Update 1 from St. Anthony’s: Windows Ordered! Since our kick-off pizza party in March, Muscle Crew II is officially off and running! 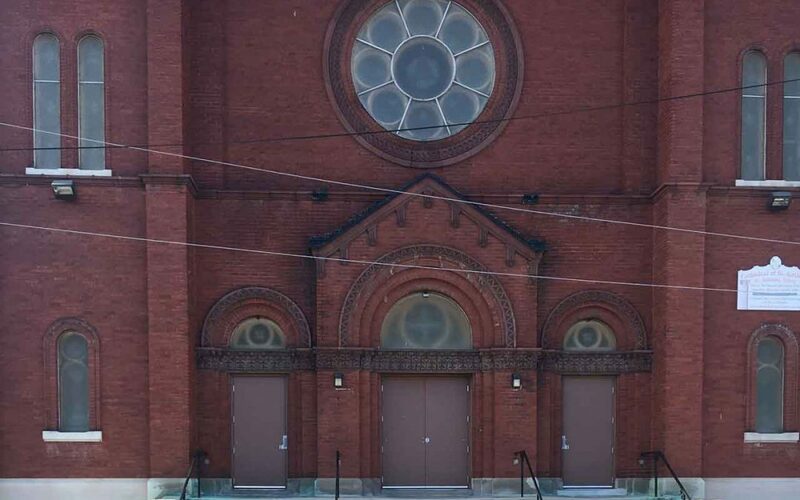 As you are aware, our first project will be replacing doors and windows at the Cathedral of St. Anthony’s in Detroit, which has a pantry that feeds and clothes hundreds of needy Detroiters each year. The project is being led by Mike Stephanoff, president of One Step Home Solutions in Warren. 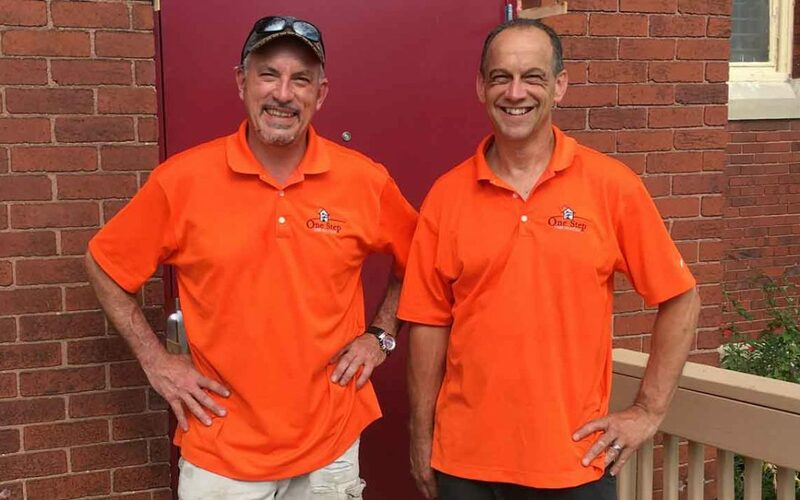 On April 7, Mike and Ron LaBarge, One Step’s VP, and fellow Muscle Crew volunteer Jim Primeau of Oxford, performed a site inspection at St. Anthony, which recently received a $5,000 donation from the Hole in the Roof Foundation. Because of YOU, all labor will be done by our Muscle Crew volunteers, with the grant dollars going toward materials. Mike’s assessment: We’ll be replacing 18 basement windows with prefabricated glass block units. In addition, a new steel entry door to the pantry will be donated by Madison Heights Glass Co​​. Thank you Madison Heights Glass Co! The windows are currently on order. Watch this space — and your email inbox — for next steps in the coming weeks. Mike will be providing a timeline for the installation, as well as his projected number of volunteers that will be needed to remove and install the new windows.